Vertical jigging for salmon, lake trout, and whitefish can be as simple, or as complicated, as we want to make it as anglers. There are some very definite things that I think set apart those anglers which generally do well day-in and day-out overall, and those that hope to get lucky out on the water. Certainly, fish are fish, and every day is a learning experience that can be humbling. Here are a few basic things that I feel are critical to understand for increased success when out on the water using a technique like vertical jigging. Rods—Rods used for vertical jigging traditionally fall into 2 categories—small, short ice fishing style rods, or longer bass fishing style rods. There are pros and cons to each. Personally, I use medium or medium-heavy bass rods for my vertical jigging needs. I like the additional length of a 6 -7 foot bass rod because I can move a lot of line on a hook set, while I still have the ability of making jigging motions as small or as large as I like. Some days, a jigging motion needs to be very small, but many days, the preferred jigging motion is larger, meant to really trigger an aggressive response from salmon and lake trout. I also feel that a longer rod is better able to cushion the hard tugs and pulls of lake trout and salmon. This way, the rod can fight the fish, not just the line. Stout ice fishing rods are small and mighty, and really lend themselves well to a smaller jigging motion, as sometimes is necessary to trigger finicky fish. Whitefish tend to like much less action, and these rods make it hard for anglers to over-work a jig. While this is a plus, the big negative side to this style of rod is that an angler can move much less line on a hook set when a fish eats a jig as it comes up in the water column. I have missed many more fish with shorter ice rods than I have with longer bass rods, unless the fish hook themselves. There is a large following of dedicated jiggers that swear by this style of rod, but my preference lies with the longer bass style rod. Reels—Fishing reels are kind of a no-brainer. Baitcasting reels paired with a baitcasting rod are my personal preference for jigging, but spinning rods also have a time and place. When paired with the proper rod, either spinning or baitcasting is a great option. I like to use the smaller bass size reels, as they get less tiring to use over a long day of jigging. Line capacity is often misunderstood, as most bass reels can easily handle 100-150 yards of line. That’s 300-450 feet of line! Considering that most jigging situations are in 150 feet of depth or less, there is more than double the capacity needed to jig and fight fish. Lines—I always prefer braided line for jigging, tied to a fluorocarbon leader of about 6 feet or so. I typically use 15 pound Power Pro line which, over the years, has proven itself time and time again. Braided line fishes well even when twisted, unlike straight monofilament or fluorocarbon. Braided lines also offer a huge advantage in sensitivity—something that is needed to help detect the bottom when it’s windy or wavy out. Braided line also helps to get a good hookset when fishing in depths over 30 feet. With almost zero stretch, braid gets the hook penetrated almost immediately when the hook is set, as opposed to monofilament which has almost a 40% stretch factor. With a limber bass rod, braided lines won’t pull out of a fish’s mouth as many would believe, because the rod cushions the line. Fluorocarbon leaders are a must in our clear water, as fish can be line shy, even at depths of 100 or more feet. Fluorocarbon has the same refractive index as water, and is nearly invisible underwater. I prefer a 6 foot section tied directly to my braided line. Another added bonus of fluorocarbon is that it is much more sensitive and has much less stretch than monofilament. With braid as my main line, and a fluorocarbon leader, I am now ready to jig. Jigs used for vertical jigging are as varied, and they all have their time and place. While each may trigger bites on any given day, there are a few basic things to understand within the jig category. How a jig falls, and the action that it gives when jigged, can have everything to do with how well a day can go on the water. Having a variety of jigs on the boat, and an open mind about experimenting, can really help to boat more fish. Also equally important can be jig weight. How quickly a jig falls can also play a large role in triggering bites, or going unnoticed and ignored. I prefer jigs anywhere from 1-3 ounces for lake trout and salmon. When vertical jigging a species like burbot or whitefish, smaller jigs can be the ticket. For these fish, I prefer jigs in the ½-1 ounce range. I almost always use either a snap swivel or a line snap to attach my jigs. I nearly never tie directly to the jig when I am using treble hooks. However, when using jigs that have a single free-swinging assist-style hook, I will tie directly to the split ring, as these baits were intended. Flutter / Butterfly style—this is a style of jig that is most commonly used in saltwater. These style jigs usually have a horizontal flutter fall, but within this category, there are differences in the upward motion. Some pull straight upwards when jigged. Others have a side-to-side flutter when pulled up in the water column – Jonah Jigs is a prime example of this style of jig, as are Shimano Butterfly jigs. Corkscrew fall style—these style jigs are also often used in saltwater, and have a spiral action as they fall. Different species of fish seem to like these falls better. 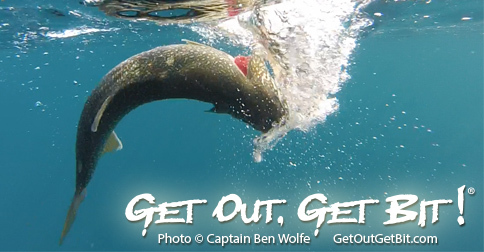 Lake trout and salmon often prefer a flutter style of fall in the water, but there are days when a corkscrew fall is the only way to trigger bites. The Shimano Coltsniper is an example of this style of jig. Swedish Pimples fall into both the flutter and corkscrew style categories, since jigging motion can create both actions. Shad style—These style of jigs are more football shaped, more closely mimicking a shad body. They have action on the fall as well as a tight vibration on the up-jig motion. These baits work wonders when there is a big shad or alewife population that fish feed on, and here in the Great Lakes, alewives are a staple for salmon and lake trout. S-shape style—This category of jigs has a slight bend in them, resembling a softly-curved letter "S". The bend in these jigs promotes a lot of water displacement both on the jigging motion up, and the fall of the jig. This not only produces an erratic action, it also has a lot of vibration, which can really help to bring fish in from a distance. BBM and Elk Rapids jigs are options for Great Lakes anglers. Jonah Jigs and PLine jigs can be bent to create an "S" shape, altering both the fall rate and action. Do nothing style jigs—this is a style of jig that is most commonly used when the water is very cold. BBM makes a jig called a sand kicker. This jig does nothing, but jig up and down, with no side to side or fluttering action. Lake trout, whitefish, and burbot love these jigs when the water is cold, and they are often used by ice fishing anglers. Here, it is critical to tie the fluorocarbon directly to the jig without the use of a snap or swivel. Bites from salmon and lake trout can be varied, despite an aggressive nature overall. Understanding the different types of bites can help to land several more fish over the course of a day on the water. On the fall/drop—Lake trout and salmon like to hit on the drop, as the jig is still falling through the water column. Bites on the fall can, themselves, be split into two distinct categories. First are the bites that occur as the rod is moving downward, following the jig on the fall. The bite occurs, and the rod is jerked down aggressively. An immediate hook set upwards is the way stick these bites. The second way salmon and trout bite requires attention being paid by the angler. It’s not uncommon for a laker or a salmon to swim up in the water column to grab the jig, putting slack into the line. Anglers should be aware of how far they are lifting and dropping their jig, and should the jig not fall as far as it should, this is a sure sign that a fish has it, and a big hookset while reeling like crazy can often times stick these aggressive biters. A common telltale is a pile of line on the surface instead of a semi-taught line as the jig falls. This happens multiple times throughout most guide days, and the anglers that notice this are quite often rewarded with a fish that may otherwise have gotten away – the jig spat out quickly. On the uplift—it’s not uncommon for bites to occur on the uplift of a jigging stroke. An angler is lifting the rod, and all of a sudden, there’s slack in the line when the weight of the jig should be keeping the line tight. A quick hook set is the only way to stick these fish, and a longer bass style fishing rod is critical here, due to the added ability to move line quickly. Jigging away—When using good sonar units to mark fish, it is common to see our jigs fall towards fish. One way to trigger a reaction strike from lake trout and salmon is to mimic a fleeing baitfish. In order to get this kind of response, a jig can be jigged up and away from fish to trigger bites. A quick jig, reel several cranks, another quick jig, followed by more cranks of the reel is the most common method used to trigger these powerful reaction strikes. Another alternative form to get fish to chase a jig, is to just reel quickly away from fish that are known to be in the area. It’s fairly common to hook a fish reeling quickly when another angler on the boat has a fish on, and the angler is simply reeling up to get their line out of the way. On a recent trip, I had a fish chase my jig all the way to the boat from 87 feet of water, trying to eat the jig even as it came out of the water! Had I known I had a chaser, I would have slowed down just a smidge, to give the fish time to eat, but since I was focused on getting the net for my customer, I had no idea that I had an aggressive lake trout chasing my jig. Boat control is critical in the sense that we need to understand how we are going to fish. Do we need the boat to hold in a specific spot because we want to fish a particular depth or contour break line, or do we intend to drift a flat covering lots of water looking for active fish?. To further discuss boat control means to break down into two categories how we intend to present our jigs. For salmon and lake trout in particular, jigs should often be close to the bottom, if not occasionally bumping the bottom. If we intend to drift with the wind, we can use a motor, whether it is an electric trolling motor or a kicker motor, to hold the boat in a particular depth as we drift along. Using a drift sock can greatly slow the rate of drift, very often enabling us to feel the bottom. Drifting too quickly pulls the jigs away from the bottom, and more and more line must be let out to continually stay in contact with where the bottom is, and where the fish mostly hold. For this technique, boat speed is the crucial aspect that will help success rates. For vertical jigging, the more vertical our presentation, the better our success when fishing a specific depth or contour break line. To hold in a particular spot, depth, or contour, I prefer the use of an electric trolling motor to accomplish the task, but a kicker motor put in and out of gear is a perfectly acceptable alternative. While holding on a spot, it is also possible to cast jigs out away from the boat, let them fall and jig them back with great results. Jonah Jigs creator, Larry, shows Capt. Ben Wolfe of Sport Fish Michigan how he rigs to fish for lake trout, whitefish, and salmon on Grand Traverse Bays near Traverse City using the vertical jigging technique for deep water. Vertical jigging is a hands-on technique using jigging spoons that is extremely effective at targeting fish holding in deep water. A Wolfe Outfitters fishing customer catches a giant salmon while casting crankbaits on the Big Manistee River in northern Michigan.